The other day I got the kids all set up painting away and then wondered what I should do while they were busy messing. When they are painting I always make sure that I am nearby in case they take the notion to paint walls and furniture like they see mommy do on a fairly regular basis. So I decided to join in on the fun. Here are the results. I am pretty pleased with how it turned out, and although when I started painting this fabric I had no intentions of it being actual art, or for it to hang here I am pretty pleased with it. Want the DIY Details? Click on Read More to follow the jump. I started with a large piece of fabric. I believe it was drapery lining that I was using (just what I found in my stash). Then I primed it with white drywall primer. Any primer would do the trick that is just what I had on hand. 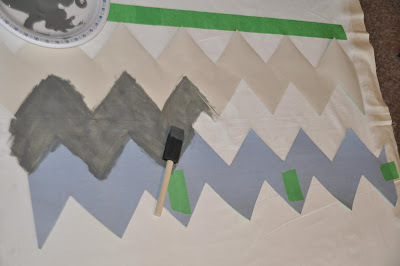 I made myself a stencil out of paper from the kids art easel and started painted in between my two stencils. 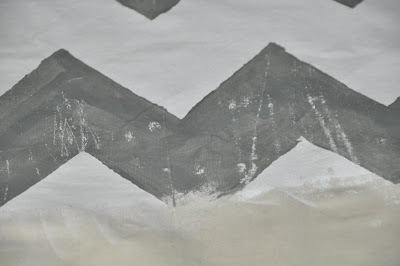 It is best to use a fairly dry brush so the paint does not bleed underneath the stencil. I continued painting until I had all my zigzag's painted. 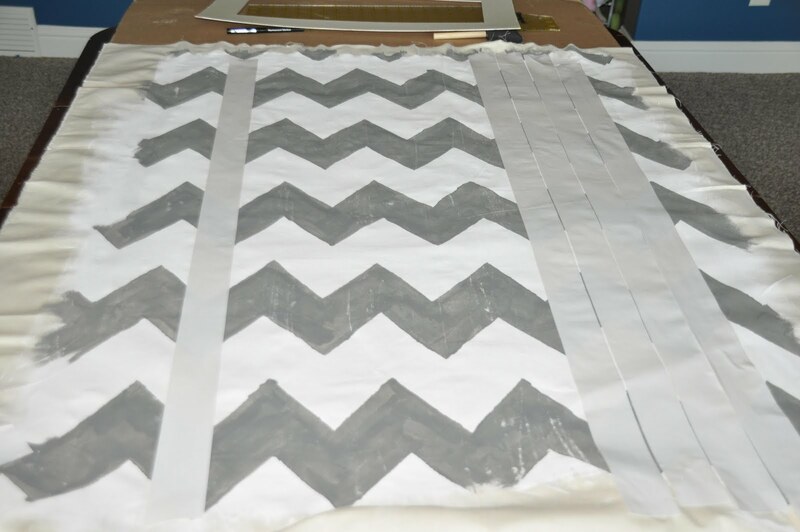 I wasn't really happy with this crisply painted look and thought it needed a little more depth so I ran a couple of rows of double sided carpet tape down the full length. Press down and rip off. I reused my strips until I had the full piece done. Here it is with a little more ruffed up look. A close up of what the carpet tape accomplished for me. I picked up a large frame at the salvage center for $1 and painted it our trim color. Here it is again in its new home. so cute! What a fun idea!!!!!!!!!!!!!! This looks fantastic. I love it and it looks great behind the bed. Did you make your pillows? 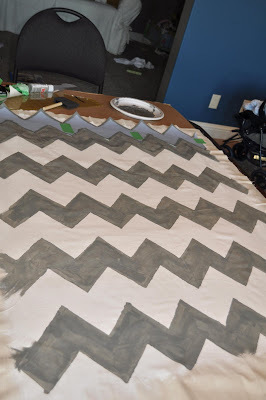 This is awesome...love chevron....I'm working on something that's going to have the chevron design....thanks for linking this up! You did such a great job! 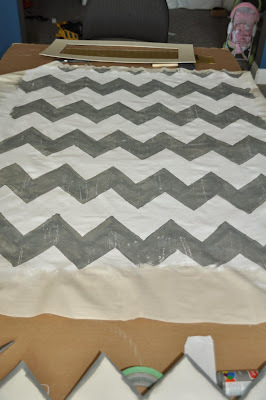 I have fallen in love with the chevron pattern this year. I love the pillows on your bed too! So cute - it looks great on your wall! I love your room! The purple pillows are really cute! Love your painting! Oh I love that. It looks really good about the bed. 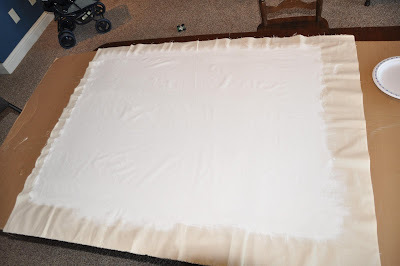 I love the spin on it, this one being on fabric!